Lux Ex Umbra: EONBLUE: CSE cyber threat detection system "deployed across the globe"
EONBLUE: CSE cyber threat detection system "deployed across the globe"
[A]t over 200 locations around the world, spies from Canada's cyberintelligence agency have been monitoring huge volumes of global internet traffic travelling across the internet's core. And in fact it wouldn't be exempt. CSE can and does monitor Canadian communications and other Canadian data that pass through its foreign-intelligence and cyber-threat collection sensors, and it is entirely legal for it to do so as long as that data wasn't specifically targeted for collection on the basis of its being Canadian or being related to a specific Canadian or person in Canada (i.e., the National Defence Act requires only that CSE's Mandate (a) and (b) activities "not be directed at Canadians or any person in Canada" [emphasis added]). If CSE targets material on some other basis and some percentage of the information pulled in turns out to be Canadian-related, as inevitably some will, that is considered "incidental" collection, which is permitted under the law as long as a suitable Ministerial Authorization is in place. It is also worth noting that CSE does have the ability to target Canadians when it is operating under its Mandate (c), i.e., providing support to federal law enforcement or security agencies, but in that case the targeted Canadian must be the subject of a judicial warrant obtained by one of those agencies. In other words, CSE’s partner agencies—or another division within CSE itself—are likely responsible for gaining physical access to internet infrastructure, and then making that data available to programs such as EONBLUE. I think that's correct. 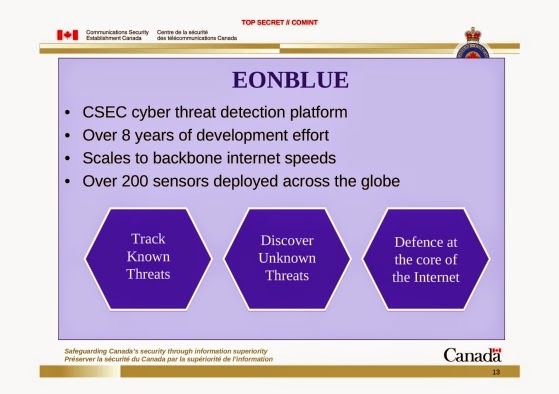 Note also that the slide (which is reproduced in Braga's article) shows that EONBLUE is also deployed at "CANDLEGLOW (FORNSAT)", which apparently refers to CSE's foreign satellite monitoring activities at CFS Leitrim, just south of Ottawa.